Today, the immunological mechanisms around a kidney transplant are poorly understood. It is therefore difficult to predict the success or failure of a kidney transplant. How to improve the diagnosis of transplant rejection? To answer these questions, the KTD-innov project integrates on a large scale the systematic evaluation of patients' clinical, biological, immunological and molecular data. The study will establish a baseline database. 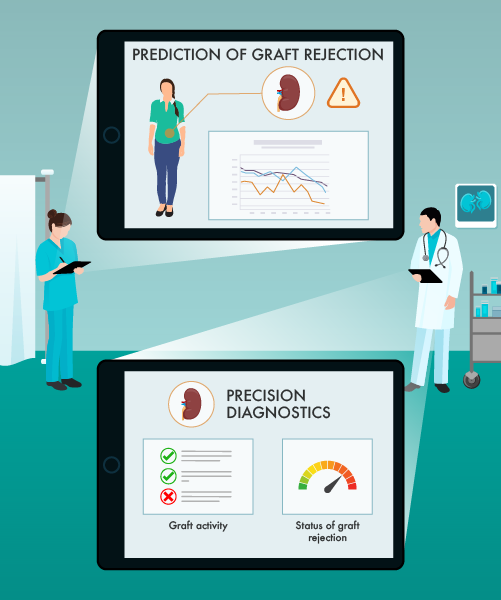 a precision diagnostic system addressing the activity and stage of graft rejection. The KTD-innov study is based on the collection of data from 750 new patients recruited over one year in 7 French hospitals. This data will be consolidated with 5,000 pre-existing references shared by the partners at the beginning of the project. The data are based on urine analyses, blood samples and allograft biopsies.